Wednesday we packed up for warmer weather. Of course not without problems. Our jack leveling system does not like cold weather. The jacks came up but the sensors said they were still down. Which means a annoying warning alarm beeps at you continuously. It wasn't until we were half way back down to Lake Pleasant that the beeping stopped. Arriving at Lake Pleasant Regional Park we checked in and managed to get a nice site. Not the same one we had before but two sites away. 20 minutes later the bird feeder was up, chairs out, and grill set up. It's nice to be back where it's warm. We decided to get a few errands out of the way, so we hopped in the car and headed out. We wanted to get our PowerTank (which we use for filling tires) refilled with C02. A welding supply in Phoenix was recommended, and they were gracious enough to fill it on the spot. Normally you have to leave it overnight. Then we headed over to Bookmans to trade in some books and use up some store credit we had. Then back to the RV for fish stew for supper. Yesterday we decided to go exploring with the Explorer. Judy packed us a lunch and we headed off on Castle Hot Springs Rd. Yes, the same road that our GPS misguided us a few weeks ago. See blog entry from a couple of weeks ago. This road makes a giant U about 20 miles long. We were cautioned it might not be passable. 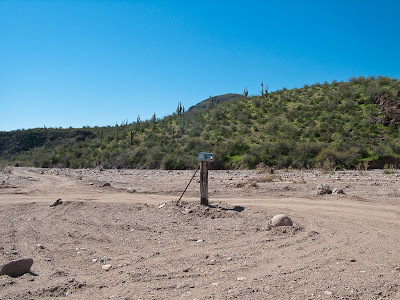 About 6 miles down the road we found ourselves driving down a river wash. Kind of weird to find this mailbox out in the middle of the river bed. After crossing the river a couple of times with water a foot or so deep, we came to another crossing that didn't look good. After checking it out on foot, and realizing if we got stuck it would be really expensive to get towed out, we decided to turn around. Maybe when things dry out we'll give it another try. 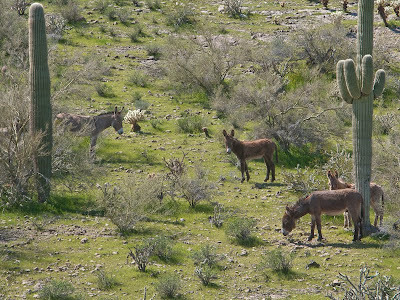 On our way back out to the main road we saw these wild burros grazing. Wonder if they are related to the ones we saw at Imperial Dam? 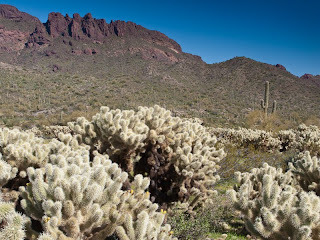 We headed off towards Vulture Mountain BLM area. 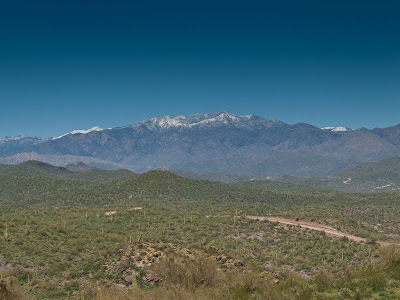 This area is south of Wickenburg, and just north of the Vulture Mine where I was last week for a photo workshop. Yes I will post some the images I shot there when I have them prepped. We found the BLM area and checked out a small group of boon dockers. I think we'll look into staying here on our next trip. We found a picnic table at the Vulture Mountain Trail Head and enjoyed our lunch. 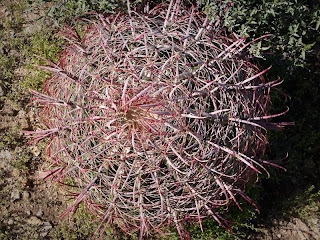 I took a few pictures of cactus. 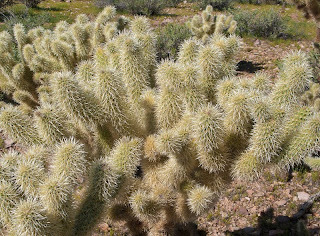 We had to be careful to keep Mollie away from the Cholla cactus. They look furry and friendly but they are not. I stepped on one and the needles stuck into my hiking boots. I sure wouldn't want to have to dig them out of Mollie. We then headed north to check out the Escapees Park at Congress. This park has a different setup than the one in Bensen. We really liked the permanent lots. The lots are large and you own the lot and any structures on it. Some of the lots had a permanent home along with room for an RV. There is a separate area for seasonal rentals. The area reserved for seasonal rentals, I think we would pass on. Too much like a parking lot. We then continued north to the ghost town of Stanton. During it's zenith as a gold mining town, miners were reputed to find gold nuggets the size of potatoes. We didn't notice any laying around so we headed back. On our way back we needed fuel, and wouldn't you know it, there was also a DQ at the Mobil station, so we enjoyed a cone on the way back to the RV. A great day of exploring. Tomorrow we are packing up and heading west. Our first stop will be Quartszite, then on to Borrego Springs.